Chadds Ford Supervisors George Thorpe (left) and Frank Murphy discuss road issues during Wednesday night’s Board of Supervisors meeting. 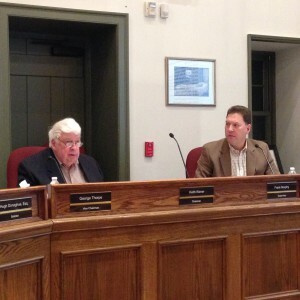 CHADDS FORD — Road maintenance, speed limit, and signage dominated Wednesday night’s township Board of Supervisors meeting. “What we thought was a pothole on Heyburn Road near Baltimore Pike is actually a deformed culvert that is losing stability of the road,” said Township Engineer Joseph Mastronardo. The cost to replace the culvert is estimated to be $100,000. According to Mastronardo, it needs to be completed in 2015, but an asphalt fix will keep it safe until then. Thorpe acknowledged her frustration and said that the supervisors will look into it. Also, the Board of Supervisors wants to reduce speed limits in key commercial and residential areas. They approved and will advertise a 25 mph speed limit on Brandywine Drive. Supervisor Frank Murphy explained how future goals will include limiting residential speeds to 25 mph and posting more signs. Supervisors also approved the 2015 property tax rate (that will remain the same), wages and salaries, and the 2015 Budget. In other news, Manager Serock announced that the township is using a new program for its ordinances. Residents can now easily review and search ordinances on the website. Serock also invited residents to attend the township’s Volunteer Appreciation & Holiday Open House on Thursday, Dec. 18, from 6:00 to 8:00 p.m. at the township building on 10 Ring Road. Also, Strategic Alliance Committee Chair Samantha Reiner reported on recent activities of this newly formed group. “We are working to refine a scope of work for a municipal-wide drainage study to determine areas of concern,” said Reimer. She has met with various stormwater specialists and plans to present drainage study findings early next year. Murphy acknowledged Reimer and her committee, stating that, “The Strategic Alliance Committee is a think tank of qualified people who can focus on big picture, long-term issues to improve our township.” Topics the supervisors asked the committee to research include traffic, enhanced revenue stream opportunities, and recreation.